In this column, we ask our favourite writers what they always reach for in the kitchen drawer. 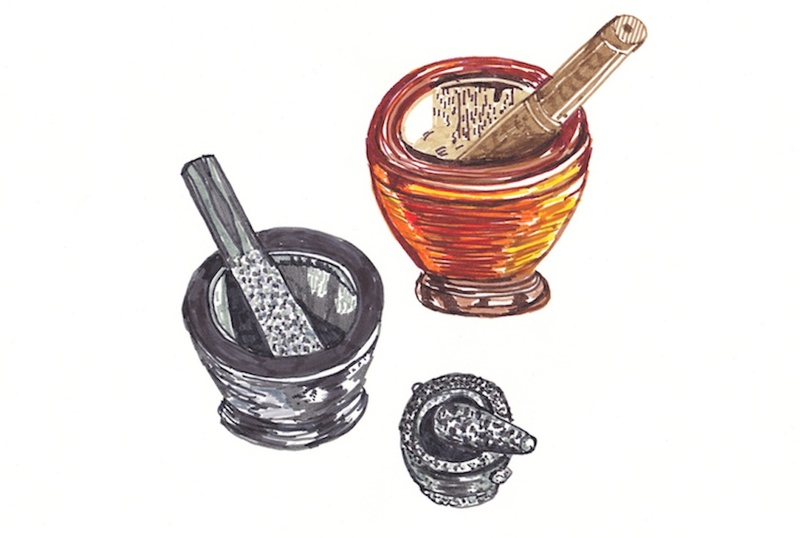 Kay Plunkett-Hogge makes the case for the pestle and mortar. To my mind a pestle and mortar is a vital part of the kitchen. I have four: three handmade from granite, of different sizes for different jobs, from the aforementioned aioli to pounding curry pastes to crushing small quantities of whole spices, and a deep lathe-cut wooden one for Thai som tum. I also have a Mexican molcajete, which might just be the perfect thing for making guacamole. Each is sturdy and reliable, like a good friend. A good pestle and mortar is not just practical, it is an object both beautiful and tactile, the apogee of William Morris’s maxim on what one should have in the house. And it is extremely satisfying to use. The weight of a good pestle in one’s hand coupled with the comforting sound it makes as it strikes the ingredients in the mortar has a “just so” feeling that ensnares the promise of good-food-to-come that can only otherwise be conjured by the smell of cooking garlic. The sound, in fact, is one of my earliest memories. I knew, as soon as I heard it, that our family cook Yoon was making som tum or one of her spectacular curries. To this day, my response to it remains almost Pavlovian. And the action of grinding or pounding or creating the perfect emulsion for rouille can be both extremely zen and the perfect venting of frustration at one and the same time. Of course, you can make everything you’d make in a pestle and mortar by other means. You can blitz a curry paste in a mini-chopper. You can use a Magimix for mayonnaise. You can grind your spices in a coffee grinder. But somehow, it doesn’t feel the same. It’s quicker but lacking in the satisfaction of a job well done. And the fact that I can barely lift my largest mortar only seems to add to its charm and its sense of solidity. In a strange, uncertain world, a pestle and mortar is something you can count on.